Work is under way to convert the Franke Family Reading Room in Sterling Memorial Library into a temporary reading room for the Beinecke. It will open for business on Tuesday, May 19, the same day that the Beinecke’s iconic building will close for renovation. Researchers will have access to the library’s collection via the temporary reading room throughout the closure. Due to constraints posed by the renovation, it will take at least 48 hours to retrieve materials for use in the temporary reading room. If you are planning a trip to the Beinecke Library during the renovation, please contact beinecke.access@yale.edu as early as possible to coordinate your research visit. Please note that Friday, May 8, will be the final day that researchers can use the Beinecke’s reading room. The Beinecke’s collections will be closed to research from Saturday, May 9, until the temporary reading room opens on May 19. This will give library staff time to prepare to operate the temporary reading room. 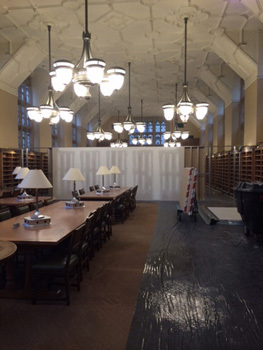 The International Room at Sterling Memorial Library is being converted into a temporary classroom to give Yale faculty and students the opportunity to work with collection materials during the renovation.